But ramps right in your face demand attention, so I cooked and ate them that evening. The flavor was delicious, yes, onion-y but not with an overpowering aroma that’s often advertised as oozing from the bodies of attendees at ramps festivals; and they were sweet. As I have done with many other wild edibles — blueberries, pawpaws, and persimmons, to name a few — I right away wanted to cultivate ramps, both for the challenge and to have them available close at hand. The friend of the friend said she would bring me some rooted plants in a couple of days, which she kindly did. The starting point in cultivating any wild plant is, of course, to look to its natural habitat. Ramps grow in moist, humus-y soil in the dappled shade of deciduous forests. 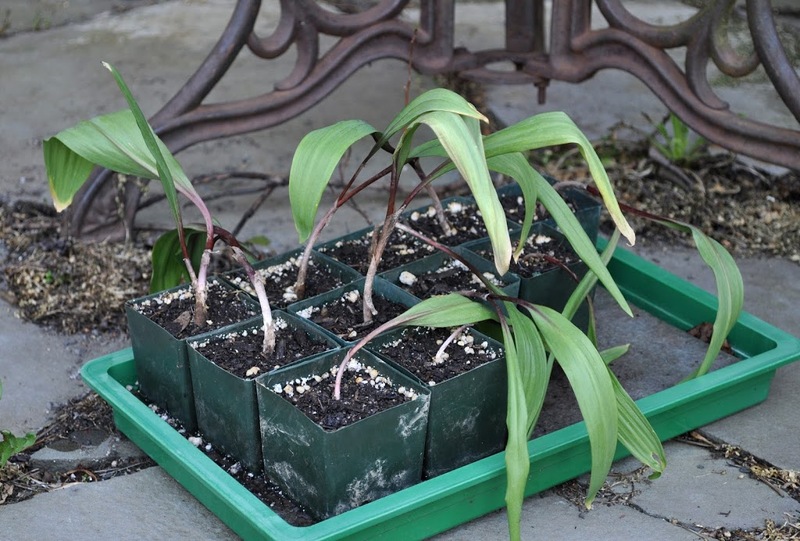 To get my ramps off to a good start, I decided to grow them for a season in pots. There, soil, moisture, and light could be adjusted as needed. The potting mix was leaf mold (just like the forest floor) with some perlite for drainage (a necessity for roots in the confines of a pot). I set the pots on a capillary mat which, with one end dangling in a reservoir of water, would keep the potting mix consistently moist. For the couple of weeks that the roots are exploring new soil, moisture loss through the leaves will be minimized by keeping the plants in deep shade. After a couple of weeks, the plants should be ready for dappled sunlight. Ramps have a short season. The green leaves emerge in spring, then die back as days grow longer and temperatures rise in June. After the leaves die back, seedstalks emerge. Many wild plants that naturally grow in shade actually grow even better in full sun — as long as their roots have adequate moisture. This is true for pawpaw and blueberry, and perhaps is also the case with ramps. I have enough plants to, next year, try different exposures and see which gives best results. The goal is to eventually plant out the ramps so they can multiply as the bulbs divide to form clumps and as the plants self-seed. The shaded, wet soil beneath my persimmon trees is one place I have in mind that might provide just right conditions for “ramp-ant” growth. Dateline Colonial Williamsburg: A magical place I first visited over 50 years ago, and here I am today for a lecture at their 66th Garden Symposium. (No lecture was involved at my first visit; I hadn’t even been talking for that long!) Strolling in and out of the many gardens — from the functional “four-square” kitchen garden behind Shield’s Tavern to the maze and clipped evergreens of the Governor’s Palace — Colonial Williamsburg is a reminder of America’s gardening heritage. What goes around comes around. 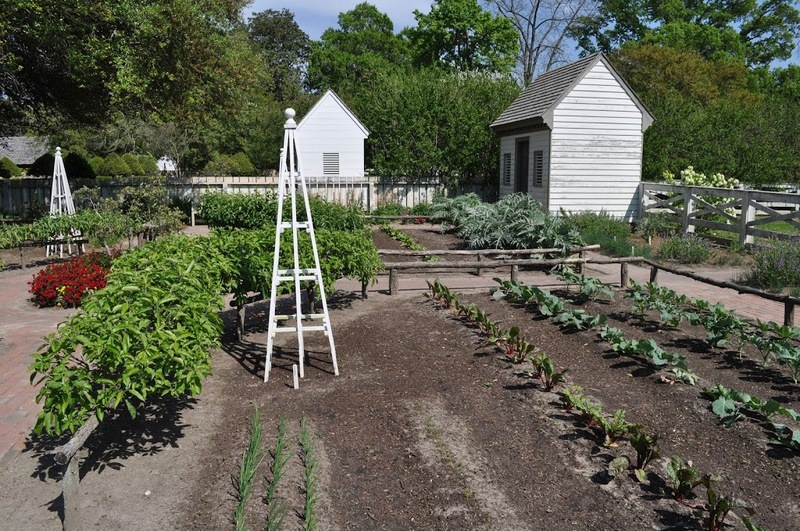 Colonists, even those with small, village plots of land, grew at least some of their own vegetables and fruits. They had to. Today, even with the panoply of fresh produce that lines our market shelves, more and more of us are planting at least some fruits and vegetables that we can reach for right outside our back doors. Now we’re doing it to avoid commercial food products too often tainted with pathogens or pesticides, to avoid the environment toll of a tomato or a head of lettuce shipped hundreds of miles, and because we want to eat fruits and vegetables with real flavor. We’re now even using some gardening techniques of those colonial gardeners. Tunnels of wire draped with clear plastic have replaced wooden hoops of yore covered with oiled paper held in place with horsehide glue. Colonial gardeners covered other hoops with cheesecloth to screen out insects; I do likewise, using spun-bonded polyester, a more modern mesh material, to keep flea beetles off eggplants. Raising beds for better drainage and early soil warming were popular then and now. The formality of Williamsburg’s symmetrical ornamental plantings have their place now also. 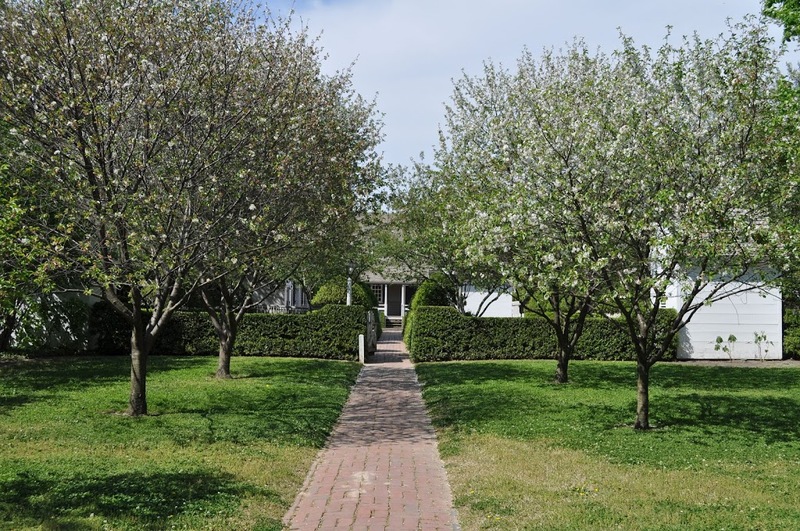 Especially if today we keep those formal planting to a size that can be maintained with the same meticulousness as modern Williamsburg’s skilled gardeners. My only objection to all that symmetry and evergreens is that, along with the brick buildings, the formal plantings take on a certain sameness; it looks pretty but makes it easy to lose your way. Okay, I’ll admit it; Williamsburg did make me jealous. Of their towering southern magnolia trees with large, leathery, glossy leaves. Such trees either don’t thrive or don’t survive this far north. (The cold limit for hardier varieties, such as Bracken’s Brown Beauty, is 5-10° F.) I also was envious of the many fig trees and pomegranate bushes growing freely outdoors in ornamental and vegetable gardens. I also grow these plants, but in the greenhouse or large pots. Colonial Williamsburg is an enchanting place. The gardens. The quiet of car-less streets. The subdued light at night. The chirping birds on spring mornings, a prominent memory from my first visit and each visit since. With Spring’s early arrival throughout the East, an added plus was the heavy blooms of black locust trees that suffused the air with their intoxicatingly sweet fragrance. I should experience that pleasure again, back home at the farmden, within a couple of weeks. This entry was posted in Uncategorized and tagged Colonial Williamsburg, ramps. Bookmark the permalink. Trackbacks are closed, but you can post a comment. Hi Lee, I just want to thank you for your blog. I only stumbled across it today, but I’m glad I did! It’s a wealth of information, and your photos are beautiful. My husband and I live in the UK, but we plan to move back to my family’s property in Maine to start a small farm in a few years. It’s wonderful to read about someone gardening in a climate that is similar to what we’ll be living in. Glad you like the blog and hope it helps when you make your move to Maine.